Gov. Doug Ducey insisted Friday that public safety will not be compromised by his decision to allow Uber to test its self-driving vehicles on Arizona roads even before the state has adopted rules for their use. 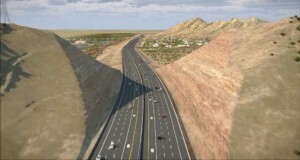 The Arizona Department of Transportation has selected a consortium of firms and companies from among three finalists to design and build a major new 22-mile-long freeway in the Phoenix metro area. Arizona will collect less than a third of the money it needs in transportation taxes to meet the anticipated needs by 2035, including keeping the state's roads and bridges repaired, a new state report shows. Experts warn that the future of transportation is changing fast, and Arizona must come up with a 21st century plan to fund the massive infrastructure needs the state is facing. State transportation planners who studied multiple options for proposed passenger train service between Phoenix and Tucson are recommending one that would follow largely existing freight railroad tracks and serve both Sky Harbor International Airport in Phoenix and downtown Tucson. Crews are set to demolish nearly 200 vacant homes, clearing the way for the expansion of a metropolitan Phoenix freeway.